This is an In Person Signed Colour 10" x 8" Reproduction Photo of the American Singer who had a Huge Hit with " Sealed with a Kiss ". Brian Hyland (born November 12, 1943) is an American pop recording artist who was particularly successful during the early 1960s. He continued recording into the 1970s. Allmusic journalist Jason Ankeny states, "Hyland's puppy-love pop virtually defined the sound and sensibility of bubblegum during the pre-Beatles era." 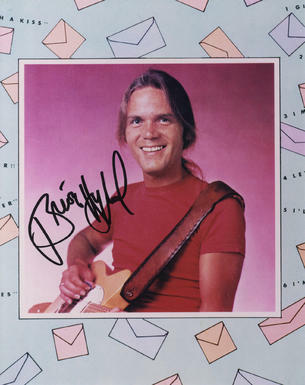 Although his status as a teen idol faded, he went on to release several country-influenced albums and had further chart hits later in his career.